Along with Sukiyaki, we had a little taste of Korea. This dish is made by a Korean friend. 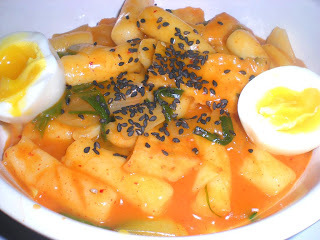 Tteokbokki might be hard word to pronounce to most people. This means in good English - spicy ricecake casserole. It is a popular street food in Korea and really enjoyed eating it. Some of the ingredients here can usually be found in Asian market. 1. In a medium bowl, soak into hot water for about 20 minutes to make it slightly sticky. 2. In a medium pot, boil 1 cup of water and add rice cakes, fish cakes, onion, green onions, garlic. 3. Add in soy sauce, brown sugar, honey, red pepper paste and chili powder. 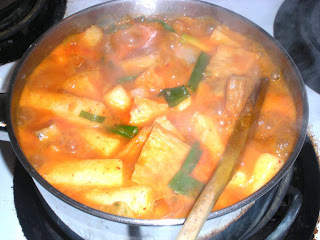 Cook until rice cakes become soft and chewy, and sauce becomes thick. 4. Turn off heat. Serve in a bowl and sprinkle with black sesame seeds. Add a hard-boiled egg to the dish. I love Korean food like this, looks great!! This looks like a spicy hot dish to warm you up for the winter! Must try this sometime! Yum! I haven't made this in a while. I usually use the long rice sticks for Chuncheon dakkalbi instead. Tis dish is a must order each time we visit a Korean restaurant. I love the chewy rice sticks and the spicy sauce...very delicious.